Stephen Miller, one of Trump’s closest advisers, a vociferous opponent of immigration, with a passion for American exceptionalism and racial superiority as well as a penchant for outrageous provocation was born 23 August 1985 4.53 pm Santa Monica, California. He was a trenchant conservative even in college, railing against multi-culturalism and Spanish-language announcements and was friendly with white supremacist Richard Spencer; later worked for Tea Party founder Michele Bachmann and then Jeff Sessions, when between them they managed to kill a bi-partisan bill allowing for immigrant registration in 2013. His mother’s family came from Belarus in the 1990s. In the past he has urged violent responses to Islamic terrorism and has spoken out against equal pay for women. 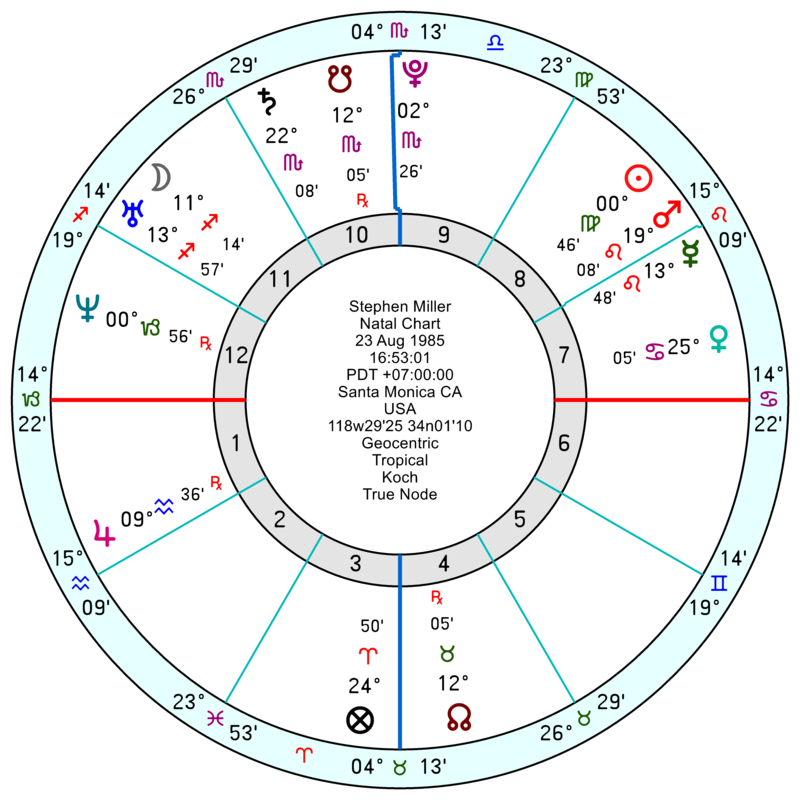 What is most notable now that an accurate birth time is to hand, is his Pluto in Scorpio conjunct his midheaven. A control-freak and then some. Pluto, especially in Scorpio, oozes contempt as a way of putting ‘the other’ down. His Pluto is further emphasised being on the focal point of a mini Grand Trine of his 8th house Sun trine a 12th house Neptune. His Pluto is also in a pushily confident square to Jupiter in Aquarius, giving him a sense that rules don’t apply to him; and that’s tied in also to the midheaven, Mercury and a Taurus North Node – he may not be likeable but he’s got staying power. His Virgo Sun and Mars Mercury in Leo being in the 8th, make him intense, secretive and obstinate. With an outspoken Sagittarius Moon conjunct Uranus in an explosive trine to Mercury Mars. His Mars is in a hard-edged square to Saturn in obsessive Scorpio in the 10th. He’s clearly got talent and has a strong get-it-together 5th Harmonic as well as leaving-a-legacy 17H. But he’s also got two heavily aspected self-defeating Harmonics – the 10H and 16H. 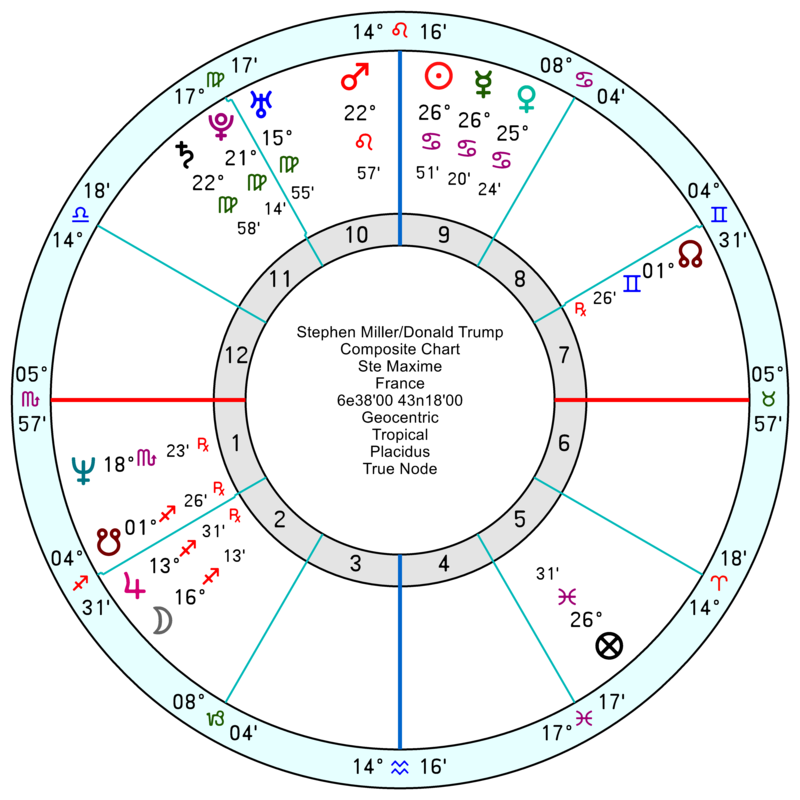 His Sun is conjunct Trump’s Ascendant so he’ll warm to the President’s bombast and flamboyance; and his Mercury is conjunct Trump’s 12th house Pluto, so he’ll pander to Trump’s less savoury political inclinations. Like Trump he has Venus in Cancer and a Sagittarius Moon, so they will resonate together. 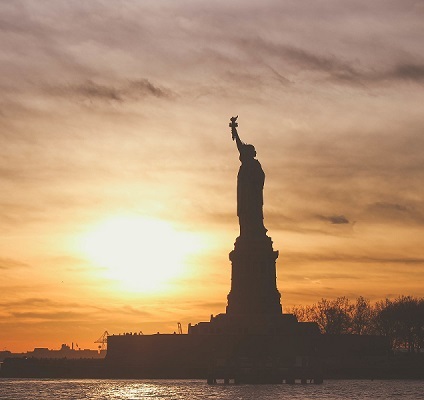 His relationship chart with Trump is complicated – friendly at one level with a composite Sun Venus Mercury; though destined to live through times of great upheaval and change with a composite Uranus Pluto Saturn; with the potential for disappointment with Sun Venus trine Neptune and Mars square Neptune. There has been a volatile mood between them recently with tr Uranus square the composite Venus, Mercury and Sun. With an abundance of undermining (and delusional) Neptune around. 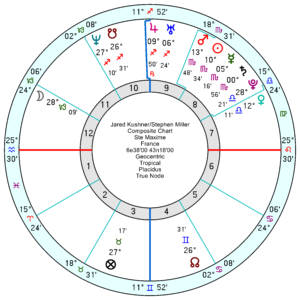 Tr Neptune is opposing the composite Uranus and then square the composite Moon in May, both influences running on through 2019, which will slowly erode foundations of trust. 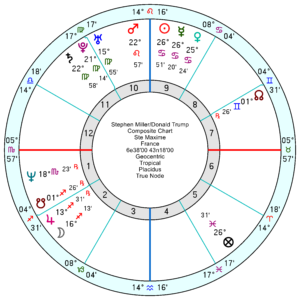 With much confusion and a discouraging slog through 2019/2020 as tr Pluto is trine the composite Saturn. Add on 2019: What’s interesting – and heartening – is that tr Saturn is now moving below his Ascendant and through his lower profile first quadrant for seven years ahead. It will take time to kick in but it usually leads to missteps, misjudgments and failures and an undermining of ambitions. 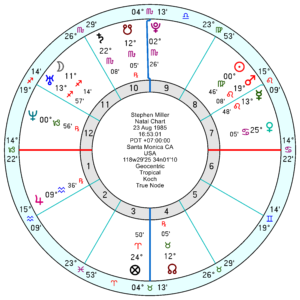 This year he also has a huge upheaval with tr Uranus opposition his Pluto from mid this month and then opposition his midheaven in late May, repeating into early 2020. This could go either up or down but it’ll certainly change his trajectory; and allied to Saturn through his 1st house, his star will be fading ahead. 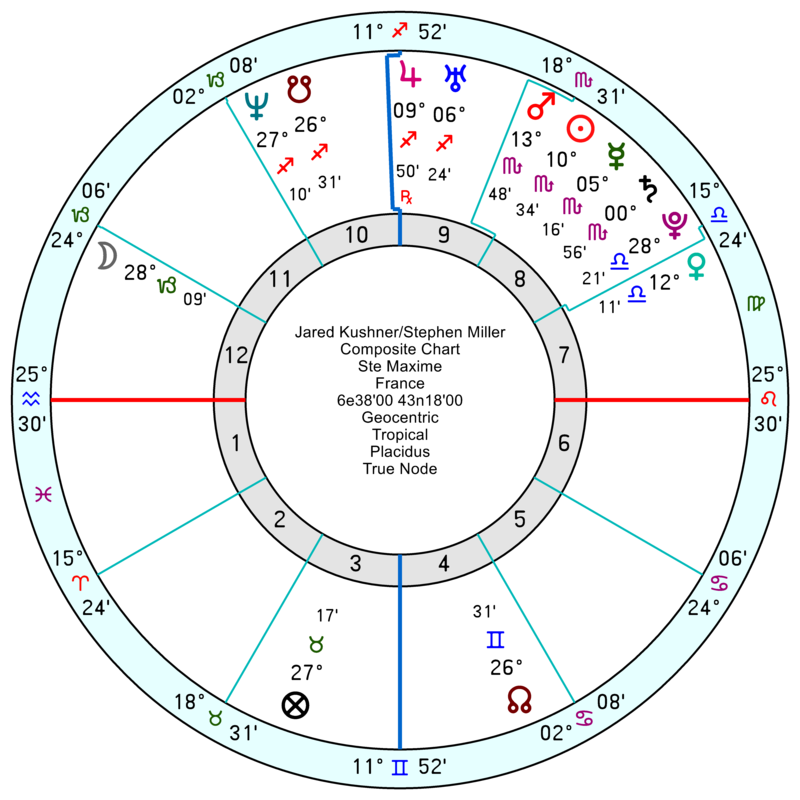 Miller’s relationship with Kushner is hostile and resentful at best with a composite Pluto Saturn Mercury and an argumentative, competitive composite Sun Mars – and is rocking n’ rolling at the moment with an eruption in June and more beyond. At this point, I think Steve Miller and/or Kellyanne Conway will be the last two standing at “The Apprentice: White House Edition”. Kellyanne, because there really is no limit to what she is willing to spin for Trump, and Steve, because he is willing to stay in background. Trump does not like people stealing his thunder. My Jewish artist friend claims that Miller looks like Joeseph Goebbels. How can someone like Miller have such negative feelings? How – and why – do Americans follow him? Did the US suddenly forget about WW2? Selective amnesia. He does. Biometry is very similar. Finns party leader Jussi Halla-aho, who might lead his party to most votes received in what’s essentially a four way rece with none of the top parties getting 20 per cent of the vote, looks like Goebbels even more, though.